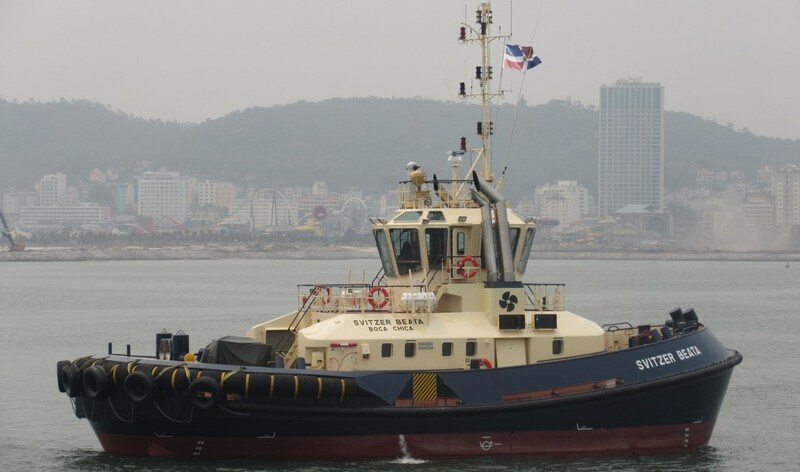 Home › Harbour Tug › ATD Tug › ATD Tug 2412 › ATD Tugs 2412 "Svitzer Maimon" and "Svitzer Beata"
Global towage operator Svitzer has taken delivery of two ATD Tugs 2412, named Svitzer Maimon and Svitzer Beata. As part of an ongoing vessel renewal programme, Svitzer needed tugs for the Dominican Public were it serves eight ports in a joint venture with Remolcadores Dominicanos. The Svitzer Maimon and Svitzer Beata are deployed at the Caucedo container terminal. Demonstrating the advantages to be gained from building vessels for stock, Damen handed over the two vessels just one month after contract signing.